This article has been written by Penny Hands, who is one of the contributors to the Collins COBUILD English Grammar. It’s about communicative grammar that learners can use in the typical situations that they find themselves in as they go about their daily lives. Moreover, it’s an approach in which grammar is not seen as a set of rules, but rather as a communicative resource. Until the later part of the 20th century, most students and teachers would have expected a grammar book to contain rules for good style. For example, a grammarian might have explained that you should ‘never end a sentence with a preposition’ or that starting a sentence with a conjunction like ‘And’ or ‘But’ is a big no-no. This type of reference, which tells you how to speak so-called ‘correct’ English, can be referred to as a prescriptive grammar. The Collins COBUILD range is the result of a project that began in the 1980s, when Collins Publishers formed a partnership with researchers at the University of Birmingham, headed by John Sinclair (1933-2007), to develop an electronic corpus of written and spoken English. The aim was to provide authentic examples for Collins’ new learner dictionary. When the first Collins COBUILD Dictionary of English was published in 1987, it revolutionized dictionaries for learners, leading to a new generation of corpus-driven reference materials for English language learners. 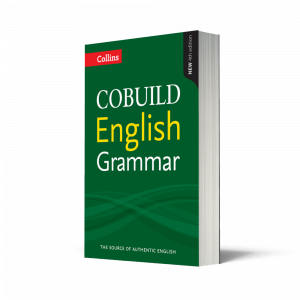 A grammar book like Collins COBUILD English Grammar, which describes the language as it is actually used, can be referred to as a descriptive grammar. So, to summarize, a prescriptive grammar serves to impose its own vision of ‘correct’ language use, and a descriptive grammar observes how language is used and passes this information on to readers. In his blog, ‘An A-Z of ELT’, Scott Thornbury (2011) describes how some trainee teachers ‘come to associate all rules with prescriptivism’ because all statements about how language works seem to be telling students how they should speak or write. So what is the difference between a grammar rule such as ‘don’t put a preposition at the end of a sentence’ and one that says ‘always add an -s to the end of a 3rd person singular verb in the present simple’? Thornbury explains this by distinguishing two types of rules: ‘rules-as-regulations’ and ‘rules-as-regularities’. The former describes rules that attempt to regulate our language use, while the latter describes observations about what regularly occurs in the language. There is always going to be some overlap, of course, but COBUILD is more concerned with regularities. Let’s look at what this means in terms of Collins COBUILD English Grammar itself. Then she heard it – the sound she’d been hearing in her head for weeks. Similarly, who hasn’t taught or learnt the rule that the determiner much is used in negatives and question forms, and is not generally found in affirmative statements? While this rule is perfectly legitimate and serviceable, our corpus data shows us certain cases in which much can be used in affirmative statements. This usage is most common with abstract nouns, particularly those relating to discussion, debate, and research. The subject is generating much debate among political and business analysts. After much discussion, they decided to take the coin to a jeweller. Regular analysis of corpus data and a perpetual ear to the ground mean that pedagogical grammarians at COBUILD don’t allow themselves to be complacent. That would be the way for rules to become ‘rules-as-regulations’ (i.e. prescriptive) rather than ‘rules-as-regularities’ (i.e. descriptive). Let’s now look at how Collins COBUILD English Grammar deals with some of the ‘old chestnuts’ of English grammar – those prescriptive rules that came about because some people thought English should emulate Latin, or ones that originated as the ‘pet peeve of a self-anointed maven’ (Pinker 2014). In writing, you can sometimes begin a sentence with a coordinating conjunction. You do this to make the sentence seem more dramatic or forceful. Some people think this use is incorrect. Why do learners need to know that some people think this is incorrect? Well, it’s all about knowing your audience, getting a feel for how conservative they are, and acting accordingly. If learners want to be absolutely sure that they won’t be marked down by an ‘old-school’ teacher or examiner, they might want to avoid starting a sentence with a conjunction. It’s up to them. Sometimes, if you avoid putting the adverb between the to and the infinitive, you change the emphasis of the sentence, or it can sound clumsy. In such cases, splitting the infinitive, as it is called, is now generally considered acceptable. I want you to really enjoy yourself. Note the caveat that a small number of people may not tolerate a split infinitive. Again, this is important advice for students who are taking exams or who know that their audience subscribes to a more traditional approach to English usage. As we can see, then, through careful monitoring of corpus data, old rules-as-regulations start to become anachronisms and new rules-as-regularities are established. Keeping up to date by reading and listening, always with a critical ear, is vital for teachers and learners. And, of course, for expert help in doing so, always be sure to have access to a good descriptive grammar.